I'm new to the site. Was recommended by Cuttlefish and Coral. Have a Red Sea nano max. Up for little over a year. Having issues with melting zoas, dosing c is not helping. But have a few sps that are growing slowly. Alk keeps dropping low. Have 2 Wyoming white clowns that are paired that I started with, a mean tailspot blenny, watchman goby, possum wrasse that eats everything and a ton of snails and crabs. Lookin' good! Welcome to the club. Hopefully you'll get some helpful answers to your challenges. It's a good community with a lot of collective knowledge to share! Welcome! Nice tank. I joined about 4 months ago and have received some great advice and encouragement in the forums. It's a great community! Welcome! What kind of water changes are you doing? Welcome! Stable alkalinity is something that is really beneficial to coral. Are you dosing 2 part solutions or just calcium in some form? 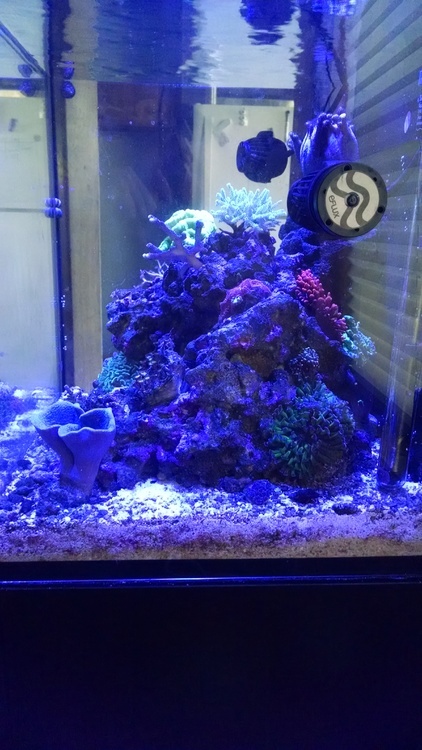 Having issues with melting zoas, dosing c is not helping. But have a few sps that are growing slowly. Alk keeps dropping low. Are you manually dosing or using dosing pumps? What exactly are you dosing? What are your water parameters? 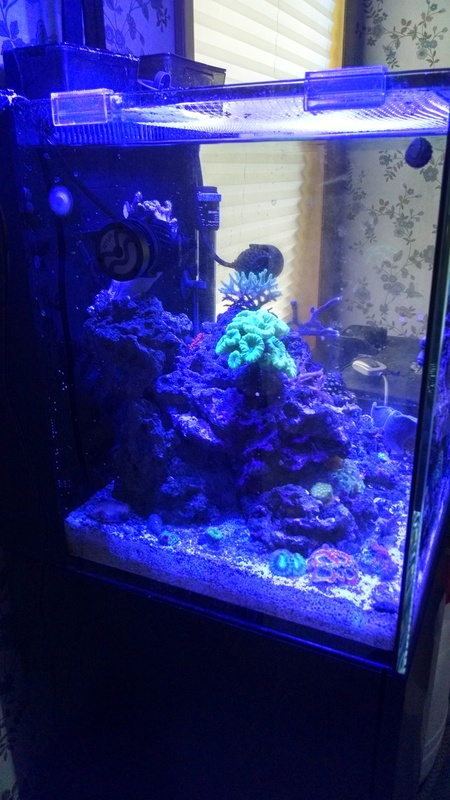 My advice on a tank that small would be to not dose anything and get religious about water changes. Welcome! Glad you found us and hope you get some helpful insight into your tank challenges. Several accomplished small/AIO tank keepers here who know there stuff. Welcome to our forum, I could say something else but it looks like it's all covered above☝️ looks like your parameters are swinging and not very stable, I would try to make them more consistent and this should help with your zoas. Does reef crystals mixed to 1.025 normally have a dkh of around 7.3? That's what mine is usually at. Seems low. I thought Reef Crystals mixed up a lot higher than that. Any chance the test kit is off? Have you taken a sample in to the store to see if you can get the same reading they do? This site says 13 dkh. There is a good thread somewhere on Reef2Reef where people compare parameters of salt mix over time. 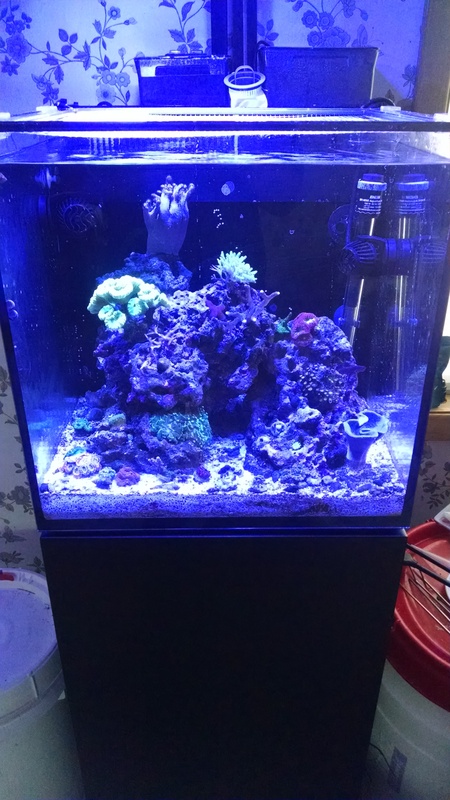 My Red Sea Coral Pro salt mixes up at alk of 9.7 dK and calcium at 420 ppm.